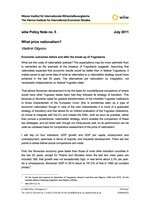 What are the costs of nationalistic policies? The expectations may be more optimistic than is warranted as the example of the breakup of Yugoslavia suggests. Assuming that nationalists expected that economic results would be better than in federal Yugoslavia, it makes sense to get some idea of what an alternative to a nationalistic strategy would have achieved in the last 20 years. The alternatives are nationalism vs. integration, not necessarily independence vs. federal Yugoslav state. That allows Slovenian development to be the basis for counterfactual simulations of where would have other Yugoslav states been had they followed its strategy of transition. This because (i) Slovenia opted for gradual transformation of the inherited Yugoslav institutions to those characteristic of the European Union (this is sometimes seen as a type of economic nationalism though in view of the next characteristic it is more of a gradualist strategy of transition) and that allows for an indirect evaluation of the Yugoslav institutions; (ii) chose to integrate with the EU and indeed the EMU, both as soon as possible, rather than pursue a protectionist, nationalistic strategy, which enables the comparison of these two strategies; and (iii) fared well, though not miraculously well, so its performance can be used as unbiased basis for comparative assessment of the price of nationalism.